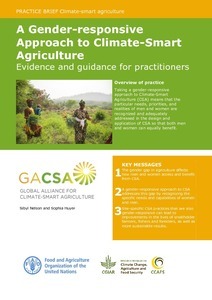 Taking a gender-responsive approach to Climate-Smart Agriculture (CSA) means that the particular needs, priorities, and realities of men and women are recognized and adequately addressed in the design and application of CSA so that both men and women can equally benefit. The gender gap in agriculture affects how men and women access and benefit from CSA. A gender-responsive approach to CSA addresses this gap by recognizing the specific needs and capabilities of women and men. Site-specific CSA practices that are also gender-responsive can lead to improvements in the lives of smallholder farmers, fishers and foresters, as well as more sustainable results.